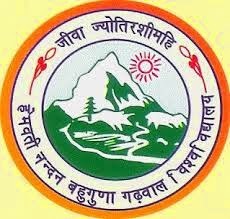 HNB Garhwal University B.Sc 1st Year Exam Results 2015 :- The HNB Garhwal University has recently announced the result of B.Sc (Bachelor of Science) 1st Year Examination results 2015. The Examination of B.Sc 1st Year was takes place earlier in the April May month. And now the university declared its result. So now all the students of B.Sc 1st Year Can check their result online. The result of B.Sc 1st year is available in the official website of the HNB Garhwal University Uttarakhand. And here below we are also giving you the result link of B.Sc 1st Year Examination 2015. So you can also get your result online from here. Follow the given instruction for result. Just click on the below given link and then you will redirected to the result page, after that fill your examination roll number on required details in the appropriate section and click to submit. After that you will able to see your result and marks details. Click here for HNB Garhwal University B.Sc 1st Year Exam Results 2015. You can also check the official website of the HNB Garhwal University for more details about results, admission and others. The official website is www.hnbgu.ac.in. Stay connected with us for more updates about examination results, HNB Garhwal University various results, admission in various universities of Uttarakhand and other news. You can subscribe and follow on our website to get all the updates from us to your email inbox.